Dale Eppinger was born on October 1, 1932. He was commissioned through the Air Force ROTC program on June 11, 1955, and went on active duty beginning December 6, 1955. Lt Eppinger completed Undergraduate Pilot Training and then Helicopter Pilot Training in August 1957. He then served with the 24th Helicopter Squadron in the Pacific from August 1957 to August 1958, before serving as a helicopter pilot and missile officer at Davis Monthan AFB, Arizona, from August 1958 to August 1963. He served as a helicopter and U-6 Beaver pilot with the 381st Strategic Missile Wing at McConnell AFB, Kansas, from August 1963 to July 1966, and then served at Barksdale AFB, Louisiana, until July 1968, when he deployed to Southeast Asia. Maj Eppinger flew UH-1F Iroquois helicopters with the 20th Special Operations Squadron at Nha Trang AB in the Republic of Vietnam from July 1968 to June 1969, where he accumulated 1,261 combat missions in just 11 months. He then served as a Helicopter Training Officer with Headquarters Strategic Air Command at Offutt AFB, Nebraska, from July 1969 to August 1972. 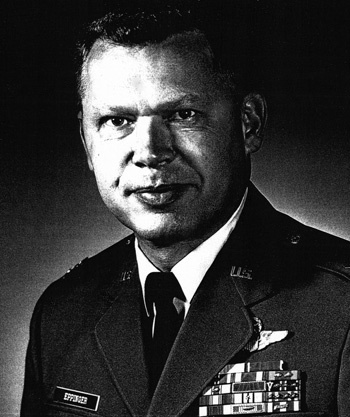 Col Eppinger attended Air War College at Maxwell AFB, Alabama, from August 1972 to July 1973, and then served as Deputy Base Commander and then Base Commander at Grand Forks AFB, North Dakota, from July 1973 to December 1975. He then served in the Office of the Secretary of Defense at the Pentagon from December 1975 to May 1978. Col Eppinger's final assignment was at Fort George G. Meade, Maryland, where he retired from the Air Force on January 31, 1986. The President of the United States of America, authorized by Title 10, Section 8742, United States Code, awards the Air Force Cross to Major Dale L. Eppinger for extraordinary heroism in military operations against an opposing armed force as a UH-1P Helicopter Pilot near Duc Co, Republic of Vietnam, on 21 April 1969. On that date, Major Eppinger, against great odds, unhesitatingly descended his aircraft through intense ground fire to rescue a seven-man, long range reconnaissance patrol which was surrounded an in imminent danger of being overrun by a large hostile force. When his aircraft was shot down during the rescue attempt, Major Eppinger assumed immediate command of the ground defensive situation and, in a further display of courage and leadership, directed air strikes against the opposing forces until their attack were thwarted, and all patrol members and aircrew men could be rescued. 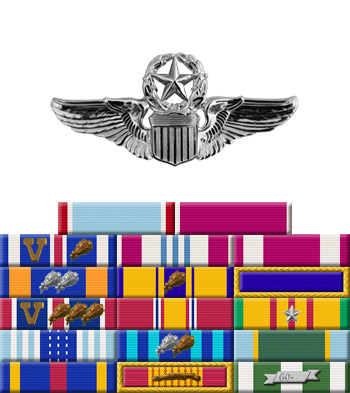 Through his superb airmanship, aggressiveness, and extraordinary heroism, Major Eppinger reflected the highest credit upon himself and the United States Air Force.